All the instruments below are pre-owned and in excellent condition (unless clearly stated otherwise). We do most of our own UK deliveries. We are happy to demonstrate the instrument and show you how to use it. This means you can ensure you are satisfied with the instrument before you purchase it and you also get to meet us! If you would like to visit us to view an instrument you are very welcome. As most of our instruments are in storage (and we are sometimes doing deliveries and are not always available!) please telephone or e-mail us to arrange an appointment. If you would like to pay cash on delivery for any instrument and you are in Europe within 400 kilometers of the Channel Tunnel we will be happy to deliver to you personally for €280.00 (EU Euros). We are happy to demonstrate the instrument and show you how to use it. This means you can ensure you are satisfied with the instrument before you purchase it and you also get to meet us! The DGX-630 is equipped with weighted graded hammer action, ultra real feel and more. All the best sounds are available at the push of button and recording virtuoso performances is simple with built-in recorder. The Yamaha Education Suite and USB connectivity add functionality. 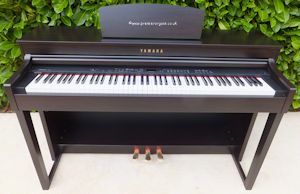 With its unbeatable quality, superb realistic piano feel and expressive sound, the Yamaha CLP430 is well suited to both exam preparation and playing for pleasure. With a superb sampled piano sound, orchestral AWM samples, an incredible range of accompaninent styles, industry leading keyboard response and Internet Direct Connection, the CVP305 gives outstanding performance for the professional and beginner alike. The Roland Vima RK-300 is an incredibly complete and versatile, all in one music machine. 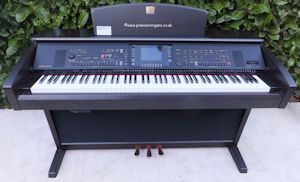 This exceptional instrument is equipped with a high quality 88 key PHA II piano keyboard and natural sounding piano samples reproducing string and damper resonance. Turn the RK-300 on and you're instantly able to enjoy the backlit colour display (800 x 480), which clearly shows all settings and functions. 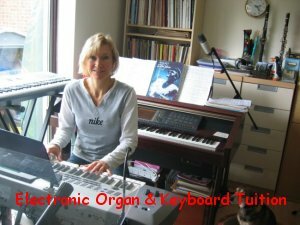 Several lesson features are available, as well as a metronome and a practical Twin Piano mode, to help you master the basic piano techniques. The special ANIME function provides real time visuals while you are playing yourself, or during playback of music files. Thanks to the sheet music and lyrics display option, you can even use the RK-300 VIMA to host karaoke parties. The RK-300 is fitted with two headphone outputs and two microphone inputs. It also features an input for a DVD player and an output that allows you to connect an external display. Additionally the RK-300 is equipped with a built in CD drive which enables you to quickly burn the tracks you have played on a CD. No external equipment needed. 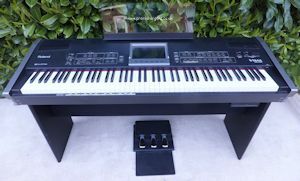 The first excursion into a new keyboard or Clavinova digital piano is often a bewildering experience. 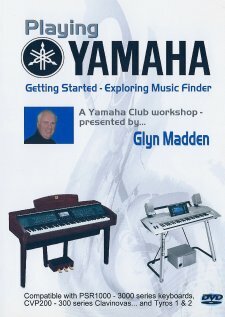 In Getting Started top Yamaha performer Glyn Madden takes you straight to the heart of the instrument - the Music Finder - to get you producing superb professional sounds in no time at all.